A trader on the New York Stock Exchange earlier today. AN EARLY RALLY fueled by Spain’s banking bailout fizzledand US stocks headed into negative territory, as the reality of more imminent risks confronting the eurozone sank in. At the close the Dow Jones Industrial Average was down 142.97 points (1.14 per cent) to 12,411.23, after an opening spurt took it up some 81 points. The broad-market S&P 500 fell 16.73 (1.26 per cent) to 1,308.93, while the tech-rich Nasdaq Composite lost 48.69 (1.70 per cent) to 2,809.73. Traders also appeared to be taking profits after US equity markets scored their best week of the year last week. The €100 billion Spain banking rescue on the weekend was a positive, but analysts said Spain still faces tough fiscal challenges and Greece’s coming election still risks putting a huge crack in the eurozone. “Although news that Spain has requested money to shore up its banking system has been regarded as a positive development… there are still concerns about the precarious conditions — fiscal, financial, and economic — that exist in other corners of Europe,” said Briefing.com. 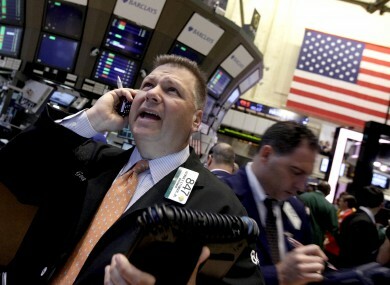 Email “Good while it lasted: US stocks sink after Spain inspired rally fizzles ”. Feedback on “Good while it lasted: US stocks sink after Spain inspired rally fizzles ”.